OSWEGO — SUNY Oswego’s Matthew J. Dykas, whose studies of family dynamics have advanced the understanding of what it takes to raise emotionally healthier children, will receive the 2012 Provost’s Award for Scholarly and Creative Activity. Several nominators mentioned Dykas’ relative youth — he’s been at Oswego five years, following post-doctoral research at University of New Hampshire’s Family Research Lab — in letters of strong support. The $500 Provost’s Award goes to full-time faculty or staff who have been at SUNY Oswego no more than seven years or to faculty or staff on term appointments. Jude Anne Cassidy, a research colleague at the University of Maryland, where Dykas earned his Ph.D. and the award for outstanding dissertation, agreed. “Matt’s research is significant because it contributes to the relatively small body of literature that has examined links between attachment and social information-processing,” she wrote. 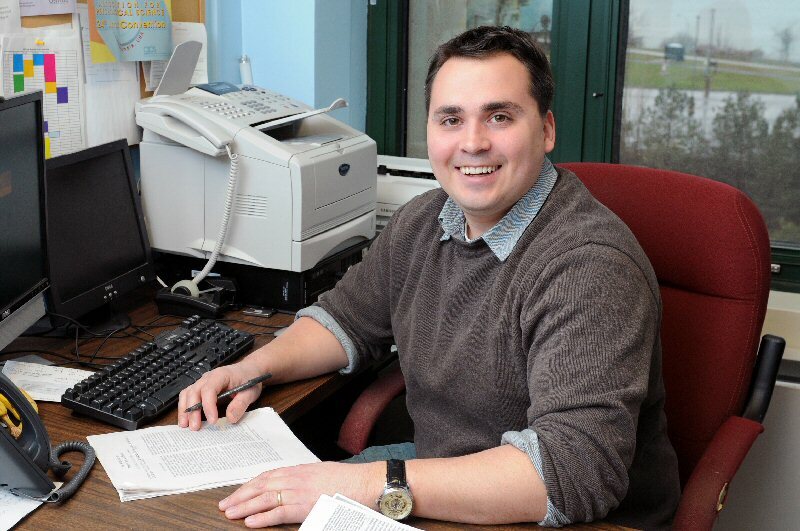 Dykas, director of SUNY Oswego’s Relationships Across Development Laboratory, serves as a research consultant with the Oswego County Family Court Collaborative. He has begun the Greater Oswego Child and Family Development Project, and has a paid consultancy with Washington state’s Council for the Prevention of Child Abuse and Neglect. On campus, Dykas helped rekindle interest in the Psi Chi international honor society for psychology and the Psychology Club. He serves in a number of psychology department roles, including first-year adviser. Wolford praised Dykas for putting into action his strongly student-centered approach to research. Wolford also credited Dykas for helping obtain a two-year National Science Foundation grant for veterans trauma research, among other grants that have included Oswego’s Summer Scholars and Scholarly and Creative Activity grants to support faculty research and faculty-student research partnerships. Brooks B. Gump, who worked alongside Dykas here and is now a professor in Syracuse University’s Falk College of Sport and Human Development, noted that all eight of the peer-reviewed articles Dykas and colleagues have published appeared in top-ranked journals, one of them in the Psychological Bulletin.